When the Michel Thomas Method language course CDs arrived at the studio, we played them on the stereo immediately. But the post was late so it arrived only the day before we were due to speak with the publishers. We tore up all our ideas and started again. Michel Thomas teaches with no homework and no repetition. Listening to him, it’s a little like being in a classroom with other students and a little like being hypnotised. You don’t learn, you flow. As a design studio, we knew we had to carry the same experience onto the phone, using just the regular audio and a decent respect for the philosophy. We designed and produced the brand new iPhone app. Check it out in the App Store: Learn a Language with Michel Thomas. You can learn French, Spanish, Italian and German. 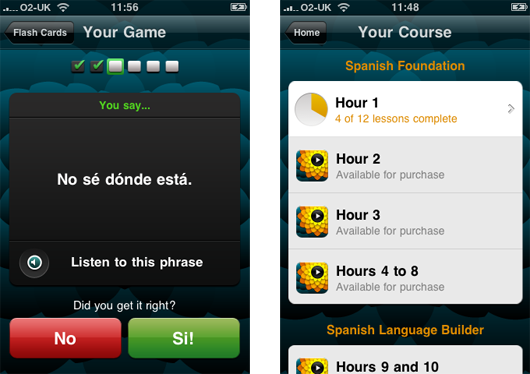 It’s free to get the app (you get a preview of each language), and then you buy hour-by-hour as you improve. In the flesh, the screen on the right is animated. It draws you in as you listen to the voice. Because mobile phones are, well, mobile, you might want to keep that learning flow going while you’re on the bus. So there’s a flashcard game. You can play one of dozens of preset decks, or make your own from favourite phrases. This one is from the Spanish course. There’s also the shop. I like that the “pay as you learn” store is in the exact same place as where you thumb through the course contents. I think we went through 4 iterations until it felt this smooth. Between this, Popular Science+, and Schooloscope, you can see a little of our philosophy about product invention. Work in the popular market, and be inventive, beautiful. Respect the materials. I believe with Michel Thomas we’ve taken what’s best about the experience and made a hybrid with what’s best about the iPhone. We’re best when we partner with people who are just working out what they want to do, and we can discover together. But what I’m proudest about is that this is a design-led product in a commercial marketplace. This isn’t just for Michel Thomas fans (though there are many). 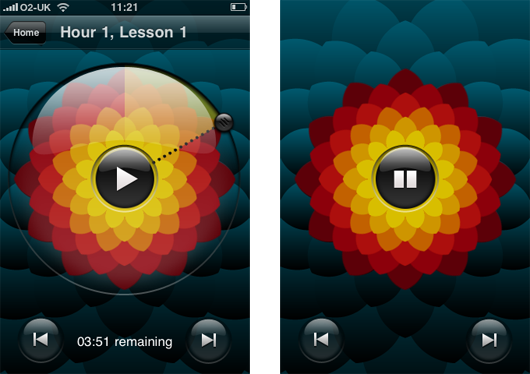 By bringing the feeling of Michel to the iPhone, his courses can find a whole new audience, and a whole load more fans. Michel Thomas is available for your iPhone and iPod Touch now, at the App Store: Learn a Language with Michel Thomas. See the official site for more pics and videos. Congratulations to the team, Matt Brown, Nick Ludlam, and Matt Jones! Thanks also to Guy Moorhouse for the microsite. And, especially, thanks to Vivian and Helen and the whole Hodder team. It has been a pleasure. Does this app really require 3.1.3? I’m jailbroken, and thus I have to stay at 3.1.2, but I’d really like to try it. If you released an update that lowers the requirement to 3.1.2 that would be awesome! I really like this app. Learning Italian for the moment. Small bug report: somewhere the word “tempo” was misspelled as “temo.” Hope you can find it. If I rewind in a lesson using the dial and then press play nothing happens (French). I can leap from lesson to lesson but on the language builder the lessons are quite long and very intense this is a function that would be very useful. Otherwise Michel Thomas’ method is excellent and so is this app.